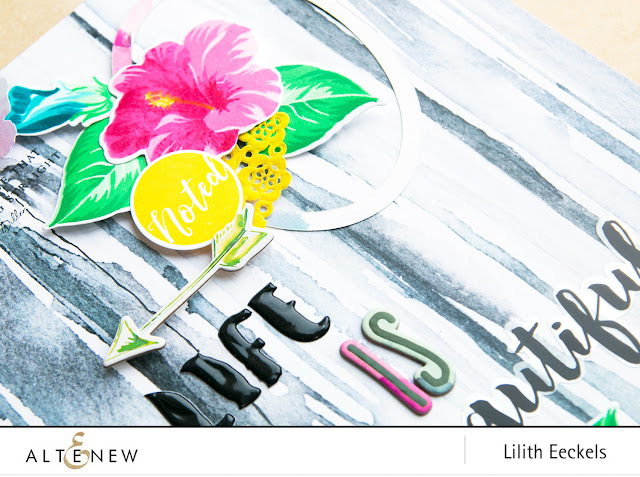 This month's Build-a-flower stamp and die set is the HIBISCUS set. Hibiscus are native to warm climates and are associated with tropical weather and relaxing summer days. Hibiscus flowers have symbolized many things throughout history, but are now most commonly known to represent "delicate beauty." This set comprises of a 6 layer hibiscus flower in full bloom, a 6 layer hibiscus bud with stem, and a 4 layer leaf image. Three sentiments are also included. These floral images work well on cards, layouts, home decor, gift wrapping, and more. We can't wait to see where these beautiful tropical flowers take your imagination! My starting point for this layout were the frames from the Create a Wreath die set. I cut out the oval shapes and then I added my clusters. I stamped each flower in three different colours using the Cherry Blossom, Sweet Dreams and Pocket Full of Sunshine ink sets. For the leaves I used the Green Meadows set. The background paper is from the Our Family collection and my title is composed with Alphabet letters from Altenew's Reflection and Our Family collections. I also used the Circled sentiments set to add some stamped words. Once again I used the same colours as in the flowers. I am also giving away a prize!!! I will draw a winner to receive a $20 gift certificate. Leave a comment by April 6th. I'll announce the winner on my blog on the 7th. Happing scrapping and see you soon. Beautiful! We have a couple of hibiscus trees in our yard, and they always remind me of summer, when they bloom so beautifully. 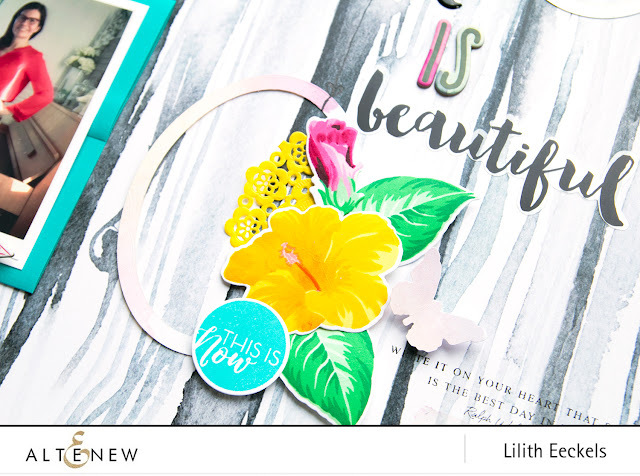 Thanks for sharing your gorgeous page - I love all the color! thanks for the coloring chart. 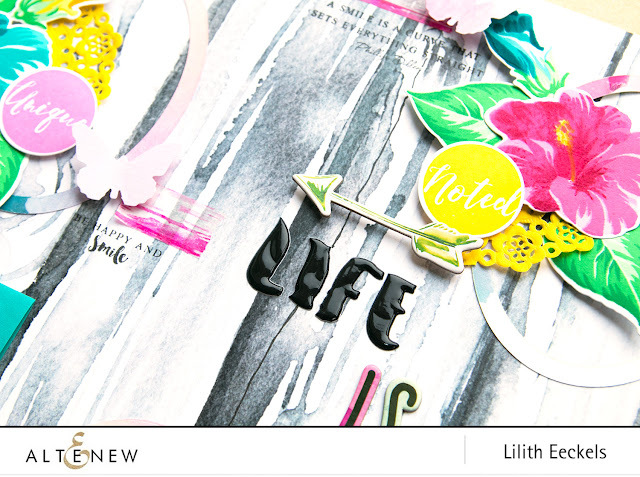 Such a beautiful layout, Lilith! Love the new hibiscus stamp set. Fabulous. I like the background and the oval clusters. I like how you translated this into a scrapbook layout. Beautiful layout! I love the hibiscus scattered around the page! So colorful and happy! Thanks for the inspiration! 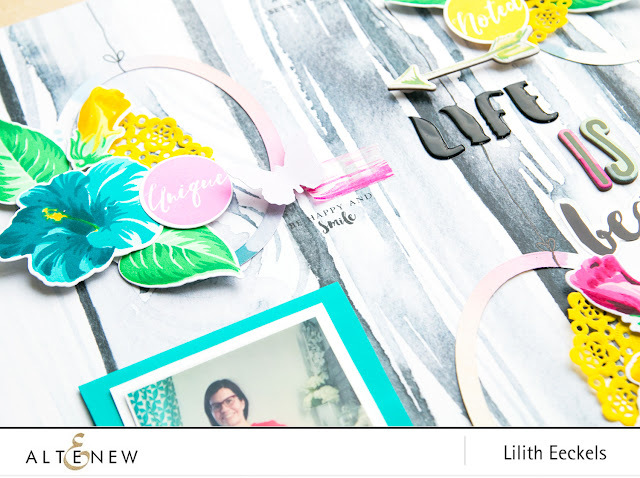 Fun and vibrant layout! Love the placement of the gorgeous floral clusters. Gorgeous set! I love your beautiful layout and the colors you used with these lovely hibiscus flowers! That's one fantastic, colorful, super beautiful creation!! Love it!! What a pretty layout Lilith. I really like the clusters of Hibiscus offset on the ovals, what a great idea. You always have such lovely pages, well done as always. Gorgeous layout! Love the colour the flowers add! 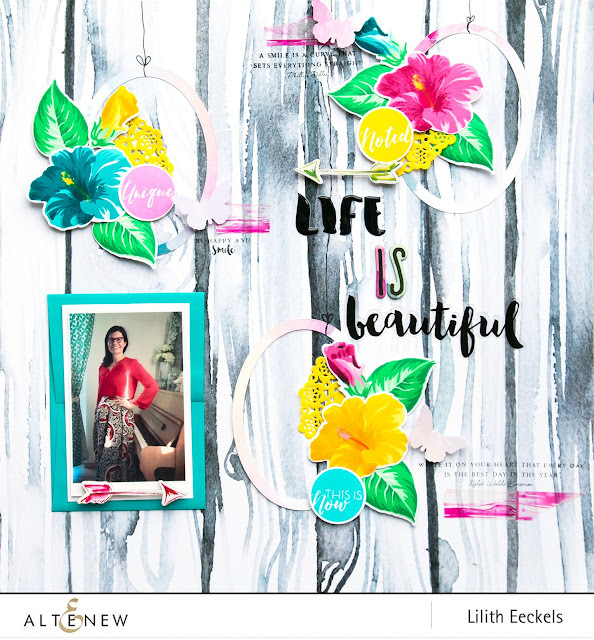 Awesome layout and full of pretty colors! Gorgeous layout! I love the pairings of the flowers and oval frames...beautiful! Beautiful layout. Love the flowers on the side of the hanging frames. I love how you used the stamped images with the sentiments. I really like the circle sentiments used in each of the floral elements. I'll be CASEing that idea! 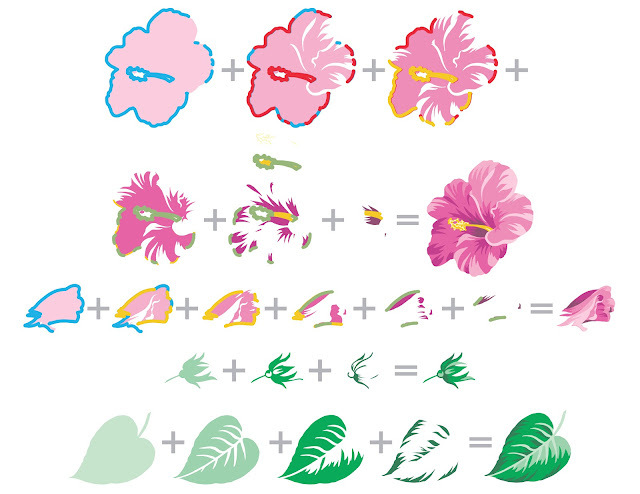 I feel like the layout of the hibiscus images really pulls your eye around the layout. I love how you have made ornaments with the frames and flowers! Simply stunning! TFS! So very very pretty. I like how the flowers are framed. And the picture is really pretty with the colours and the piano. Beautiful! Very creative layout! I like how your paired the flowers with the frames. This is a beautiful stamp set and you have done a beautiful job with your stamping, coloring and blending!! Oh boy! Another strikingly beautiful flower for my collection. The 6 layers definitely makes all the difference! Lovely layout! Beautiful! I love all the details you added, along with the beautiful flowers. Thanks for the inspiration. Great way to use the enamel dots, very innovative! Lilith, this page is lovely. The franed boquets of hibiscus flowers is such a good idea. 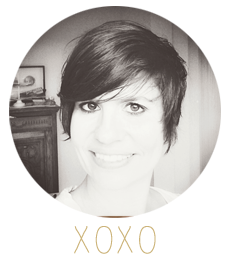 I am loving your layout! Wow! I always love your cards! The flowers and colors are b! I love the idea of using the flowers on the frames. I don't think I've seen a layout like that before, so thanks for the fantastic idea! Plus you chose the perfect colors to go with your background and photo. Thank you so much for sharing!